An attractive chimney range hood in stainless steel, this $450.24 Broan model does a great job of trapping airborne impurities without costing an arm and a leg. Installation is simple enough if you know what you’re doing or you follow the instructions. If you’re ducting to the outside, you may need assistance installing the hood. The hood needs to hang 24 to 30 inches above the range; a heat sentry feature will adjust the speed of the blower when it senses excessive heat coming from the range. Cleaning the hood is also fairly simple, thanks to a latch that releases the aluminum filter, which is dishwasher safe. 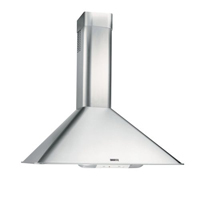 For the price and the quality, this Broan range hood is a great value.